helm-gtags.el is GNU GLOBAL helm interface. helm-gtags.el does not require gtags.el. Please do not use Ubuntu/Debian GNU gtags package. It's too old. You can install helm-gtags with the following command. You can use helm-gtags for languages which are supported by ctags(Both exuberant ctags and universal ctags) with ctags backend feature of GNU global. You can generate ctags backend tags by following command. Input tag name and move to the definition. Find tag from here and move to its definition. Input tag name and move to the referenced point. Input symbol and move to the locations. Input file name and open it. You can use those searching commands with prefix key. Show tagnames which are referenced in this function and jump to them. Update TAG file. Default is update only current file, You can update all files with C-u prefix. Create TAG file. Please choose default as GTAGSLABEL if you don't enable --with-ctags and plugin parser options. If you use homebrew on MacOSX, you can enable those features by following command. Show symbols in current file like gtags-parse-file. You can choose any files with C-u prefix. Move to previous point on the stack. helm-gtags pushes current point to stack before executing each jump functions. Move to next history on context stack. Move to previous history on context stack. Show context stack with helm interface. You can jump to the context. Resurrect previously invoked helm-gtags command. This is similar to helm-resume however this command resurrects helm gtags buffer if other helm commands are called. helm-gtags.el provides suggested key maps like gtags.el by setting helm-gtags-suggested-key-mapping to non-nil. Its prefix key is C-c as default. You can change prefix by setting helm-gtags-prefix-key. You have to set them before loading helm-gtags.el. I recommend you to use custom-set-variables for setting this value. If you use invalid modifier string(like C-,) as prefix key, please don't escape Control prefix. (OK: C-,, NG: \C-,). File path style, 'root or 'relative or 'absolute. You can only use 'absolute if you use Windows and set GTAGSLIBPATH environment variable. helm-gtags.el forces to use absolute style in such case. Show detail information if this value is 'detail, show reference point of function etc. Tags are updated in `after-save-hook' if this seconds is passed from last update Always update if value of this variable is nil. Enable fuzzy match. You should set this value before loading helm-gtags.el. 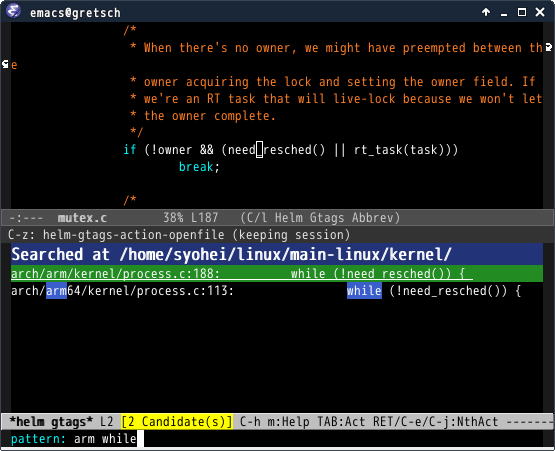 Use helm completion instead of normal Emacs completion if this value is non-nil. Maximum number of helm candidates in helm-gtags.el. Please set small number if you feel slow for large source tree such as Linux kernel. If this variable is non-nil, preselect current file and line. This variable is only for Cygwin users. If you use both Cygwin version Emacs and GNU global, please set nil to this variable. helm-gtags.el is not compatible anything-gtags.el. But helm-gtags.el is designed for faster search than anything-gtags.el. anything-gtags.el is slow in large source tree such as Linux kernel, FreeBSD, Android etc. Because anything-gtags.el creates candidates by processing output of gtags.el. helm-gtags.el creates candidates by itself, so helm-gtags.el is faster than anything-gtags.el.